Combines a mild form of Vitamin A with a transdermal delivery system in order to provide skin cells with a level sufficient to reduce fine lines and smooth surface wrinkles. Cells require meaningful levels of the compound Retinoic acid (RA) inside them to create a noticeable effect. Applying RA directly to the face causes skin irritation, and sometimes peeling, so it requires a prescription. Skin cells can convert the milder form that’s in this product into RA, but the metabolic conversion inside the cell loses 75% of the potency. Therefore, higher levels of the milder form must be delivered into the cell to have the desired result. Other products jack-up the Vitamin A concentration in their cream but still don’t get it across the skin barrier or into the cell. 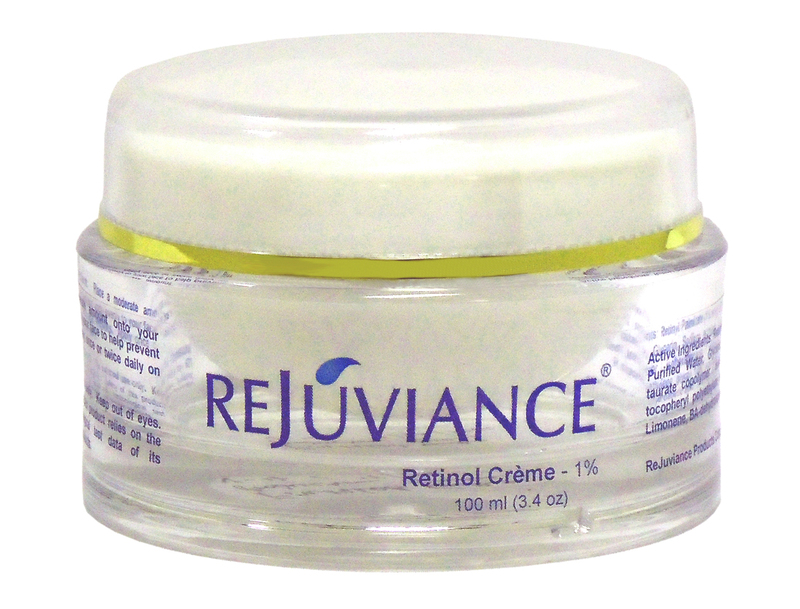 ReJuviance Retinol Wrinkle Treatment Crème optimizes cellular levels of RA by delivering higher levels of the mild Retinoid precursor directly to the skin cells via a transdermal delivery cream that efficiently carries the valuable molecules across the skin barrier to the cell. There they are converted by the cell into the RA necessary to reduce fine lines and smooth surface wrinkles. We estimate that the 1% Retinol Palmitate retinoid precursor in this product contains 250,000 IU of Vitamin A, and believe that its transdermal delivery carrier is capable of providing sufficient cellular levels of the precursor for effective RA levels inside the cell after the metabolic losses of converting it to RA. Place a moderate amount on your fingers and spread to a thin film on facial skin and neck. May apply twice daily to a cleaned area. Permanently avoid exposure of treated skin to rays of the sun. Contains no sun screen or moisturizers. Recommend using at night or under a daily sunscreen. 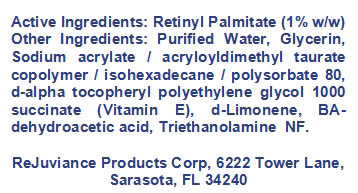 Active Ingredient: Retinyl Palmitate (1% w/w) Other Ingredients: Purified Water, Glycerin, Sodium acrylate / acryloyldimethyl taurate copolymer / isohexadecane / polysorbate 80, d-alpha tocopheryl polyethylene glycol 1000 succinate (Vitamin E), d-Limonene, BA-dehydroacetic acid, Triethanolamine NF. For external use only. Keep out of eyes. Do not ingest. Permanently avoid exposure of treated skin to rays of the sun. Safety of this product relies on the publicly available toxicological test data of its ingredients and of similar products. Vitamin A does not have much of a direct biological effect but it works via its active metabolite (biochemical derivative) called Retinoic Acid. (RA). Only Retinoic Acid and its analogs collectively called retinoids have direct effect on skin cells and can adjust their physiology toward a more youthful state. To have a noticeable effect on fine lines and wrinkles your skin cells need to end up with a cellular concentration of the RA form of Vitamin A, a concentration that is likely to irritate your skin if applied directly to your face. Instead, this product contains the milder retinoid precursor Retinyl Palmitate that must be delivered to your skin cells so they can metabolically convert it into RA. The rates of metabolic conversion are low so larger amounts of the precursor must be delivered into a cell to boost RA levels and produce meaningful results. This is accomplished in the product by enhancing cellular delivery of the precursor molecules with a novel transdermal delivery gel made of microscopic spherical vesicles that chemically mimic the outer cell walls of human skin. Called organogels, these microscopic vesicles act together as a family of super-biocompatible delivery vehicles to carry the retinoid precursor to the skin cell where it is converted into the RA needed.